Where to explore the best Wreck Diving in Norway and europe? German fighters were stationed at Herdla, and when the Allies managed to destroy the airport, Allied bombers were free to attack the ship traffic that went north and south. After many hectic attacks, we now have more than 25 vessels that we can do wreck diving on. In addition, we have several great wrecks from the post-war period that we dive regularly. 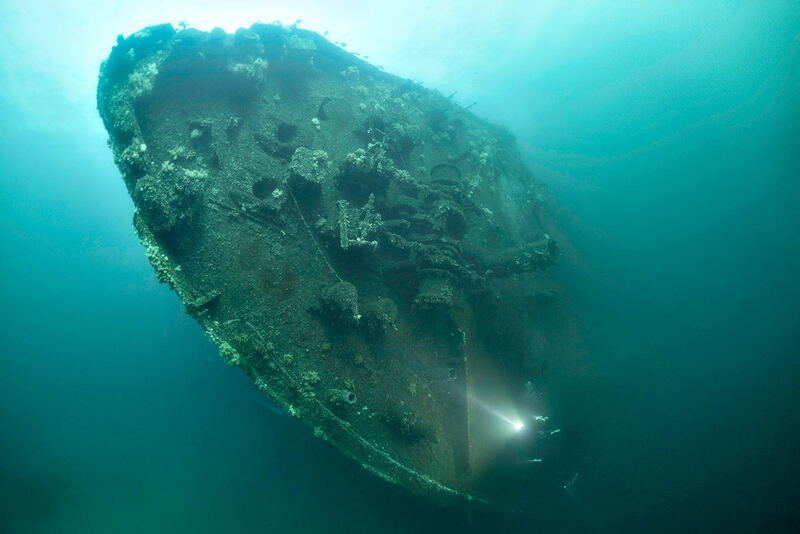 Our wrecks and wreck diving is spectacular, not only for the diving but also because of the historical perspective. This is like diving into a time capsule, where you can explore and feel how everything happened. Day after day will you visit this period that we left a long time ago, to see and discover new sides of the wrecks. You will also get more and more in-depth briefings about the wrecks, that help you to put everything in a perspective. After a week with Wreck diving, you know more about how the allied and the Norwegians fought against to get control of this very important area. These events were a turning point for how the war ran for us as Norwegian. We will be happy to host you on our wreck diving and give you an unforgettable positive dive experience. Gulen Dive Resort offers 25+ spectacular wrecks and several of them are truly world class. We can bring a range from 8 to 12 divers on the boat depending on the type of dives and plan for the diving. A thorough briefing will be given before each dive. We will do our best to make sure you get the most out of every minute under water. Read more about some spectacular wrecks, the list is an extract of more than 25 wrecks that we have in our area. Planning a trip? and have questions? Fill in the form below with any questions you have and we will get back to you soon.